They may bicker like a married couple, but Susanna Reid does not like being called Piers Morgan's 'work wife'. The 48-year-old shouted 'I am not your wife' at her Good Morning Britain co-host, 53, on Monday as they entered into a domestic-style spat over a bin. 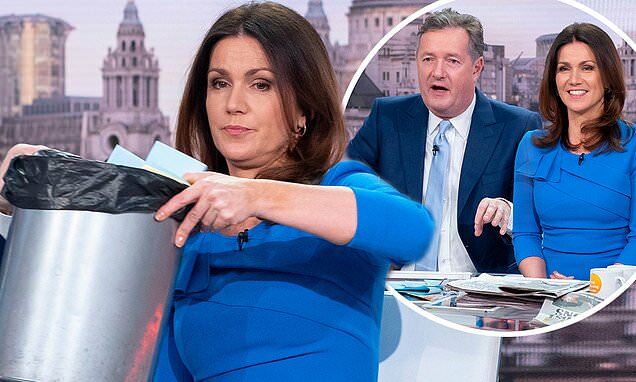 Susanna suggested that there was some 'behind the scenes tension' between the two when she revealed that Piers had removed a bin she likes to have under the desk. She joked: 'I'm going to refer to it as "bingate". The bin that is usually at my feet had disappeared. Piers claimed the offending item 'impacted his legs' and suggested he didn't need it because it was only used to discard Susanna's used scripts.